vanilla bean | Marina Cooks, Inc. In my last post, I had mentioned that I might make this Rhubarb-Vanilla Jam recipe from Food 52. I’ve decided to make my own variation on it. I didn’t read the editor’s note to the original recipe until the jam was already cooking — if I had, I probably would have halved the total amount of sugar in the recipe. The resulting jam is definitely sweet, but also complex and delicious. I decided to use half organic cane sugar, and half sucanat. I’ve mentioned sucanat before, and I really do love the deep molasses flavor it imparts — a perfect complement to rhubarb’s bright tartness. For the most effective use of vanilla beans, check out Shuna Lydon’s blog post about vanilla. Whisk together the cane sugar and sucanat. Split the vanilla beans into two halves. Lay each bean on a flat surface and scrape the interior out with a small sharp knife. Knock the oily interior into the sugar mixture and smush the seeds into it with your thumb, forefinger and middle finger to distribute evenly throughout. Place the rhubarb, vanilla-sugar mixture and water in a heavy saucepan with a generous pinch of kosher salt. Stir the mixture over medium heat until the sugar is dissolved, stirring to scrape the bottom. Continue cooking over medium heat, stirring and breaking up the fruit with the back of the spoon. Cook for about 25-30 minutes until the jam is thick, just shy of spreadable, as it will thicken when it cools. Remove the vanilla beans and reserve them for later use. Carefully spoon the hot jam into jars and leave unsealed to cool. When cool, screw on the lid and refrigerate. This entry was posted in Recipes, Vegetarian and tagged food 52, jam, preserves, rhubarb, seasonal, Shuna Lydon, sucanat, vanilla, vanilla bean, vegan, vegetarian on June 25, 2011 by marinaberger. It’s Passover week! Passover is absolutely my favorite Jewish holiday. I find the Exodus story spiritually nourishing, and you can get really creative in how you choose to tell the story during the Seder — it’s the epitome of do-it-yourself spirituality. Social justice is a big theme at many of the seders I attend. I’m slowly building my own Haggadah collection, and plan to eventually put together my own Haggadah. In April of 2006, I attended an “Exotic Sephardic Seder” cooking class taught by Jennifer Abadi at the JCC in Manhattan. The class was great — we learned to make a variety of dishes that didn’t at all resemble the typical Eastern European Jewish (also known as Ashkenazi) holiday table that I grew up with. I’m not knocking Ashkenazi cooking at all, but variety, as they say, is the spice of life. I’m going to a potluck seder Monday night, and I’ve decided to bring cookies for a few reasons: they’re easy to make in large batches, they’re always a crowd pleaser, and I love this recipe! Technically this cookie is a macaroon — all that means is that this is a drop cookie made of egg whites, sugar and almonds. No flour, which means it’s a perfect recipe for those observing Passover — which involves strict dietary restrictions involving grains and leavening. I’ve made some minor adaptations to this recipe. Namely, I replaced vanilla extract with vanilla beans, and not because I was trying to be fancy. Kosher for Passover vanilla extract is difficult to come by for a few reasons. It’s usually made from grain alcohol, which is one of the restricted food items during Passover. Also, some brands of vanilla extract contain corn syrup, and the consumption of corn products is prohibited amongst Ashkenazi Jews (see: Kosher for Passover Coca Cola®). And, for me, imitation vanilla flavor is absolutely out of the question. Hence, vanilla bean. Shuna Lydon, the pastry chef at Peels restaurant in New York City, talks about how to most effectively use vanilla beans here and here. For this recipe, I used the oily interior of the vanilla bean to make vanilla sugar. I also have a jar of vanilla sugar that I made using the ground-up pod (as per Ms. Lydon’s suggestion). You can also use the empty pods for making your own vanilla extract (which I also have a jar of in my kitchen cupboard — alas, it’s made with vodka, so I couldn’t use it for Passover purposes). And then there’s the issue of confectioner’s sugar. Confectioner’s sugar often has cornstarch mixed in with it to prevent caking. As mentioned above, corn products are a no-no for many observant Jews. Luckily, I happened to have Trader Joe’s ® organic powdered sugar, which contains tapioca starch. This satisfied my Passover needs (I’m not a strict observer, meaning I didn’t look for the “Kosher for Passover” label). In the past, however, I have ground granulated sugar in a food processor for this recipe. So, without further ado, I present to you the recipe for . . .
Make vanilla sugar. Split the vanilla bean top to bottom, vertically, into two distinct halves. Lay on a flat surface and scrape interior out with a small sharp knife. Knock the oily interior into the sugar. “Smush” seeds into sugar with thumb, forefinger and middle finger. 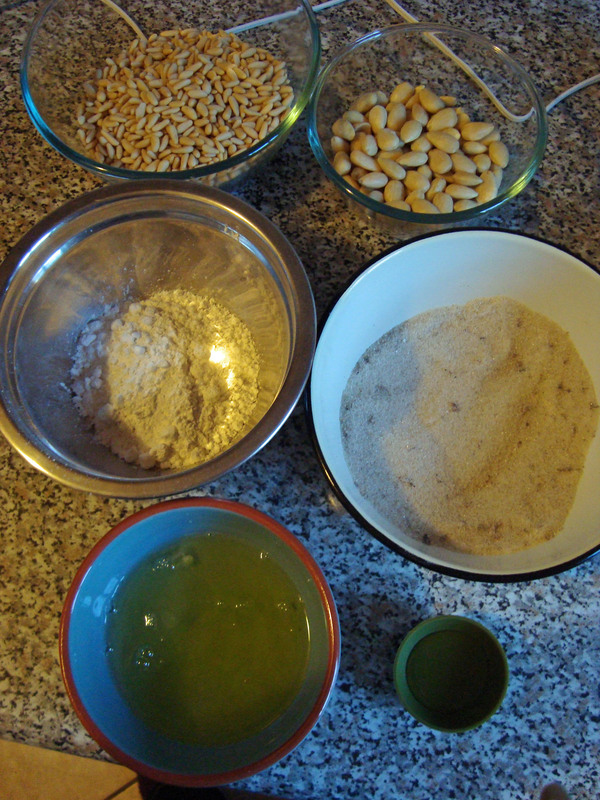 Combine almonds (ground or whole) with pine nuts in a food processor until finely ground and well combined. Add vanilla sugar and confectioner’s sugar and pulse together until a soft meal is formed. 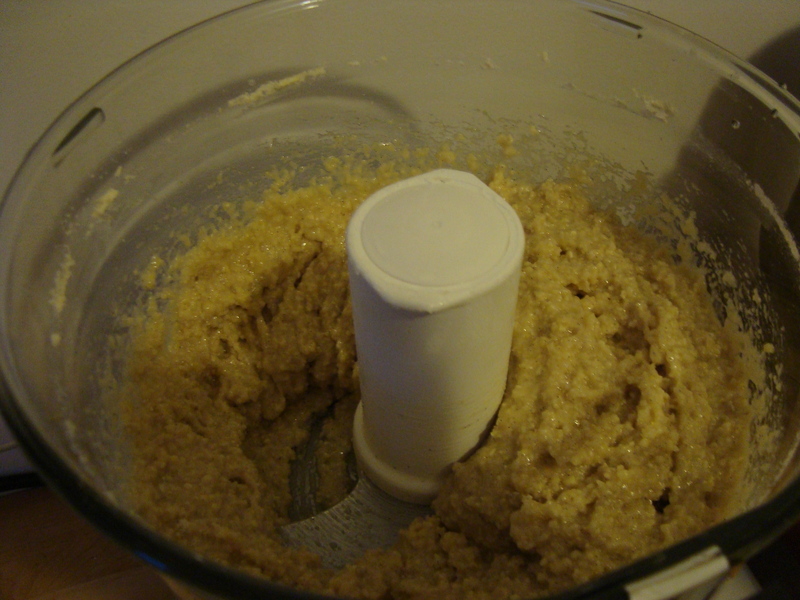 Add almond extract and egg whites and pulse mixture once again until a soft paste is formed. 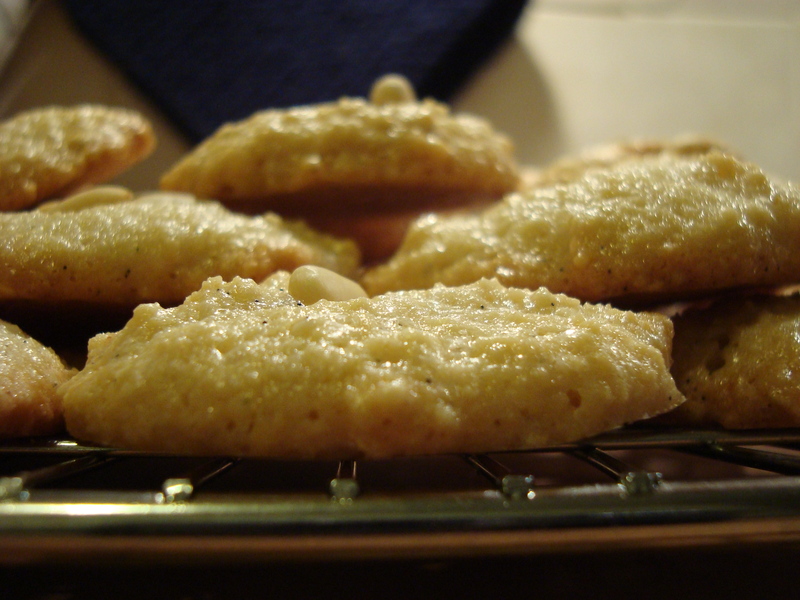 Drop one heaping teaspoon at a time onto a baking sheet lined with parchment paper, leaving one inch between cookies. Decorate each mound of cookie dough with three or four pine nuts or a whole almond. Do not press down the cookie dough. 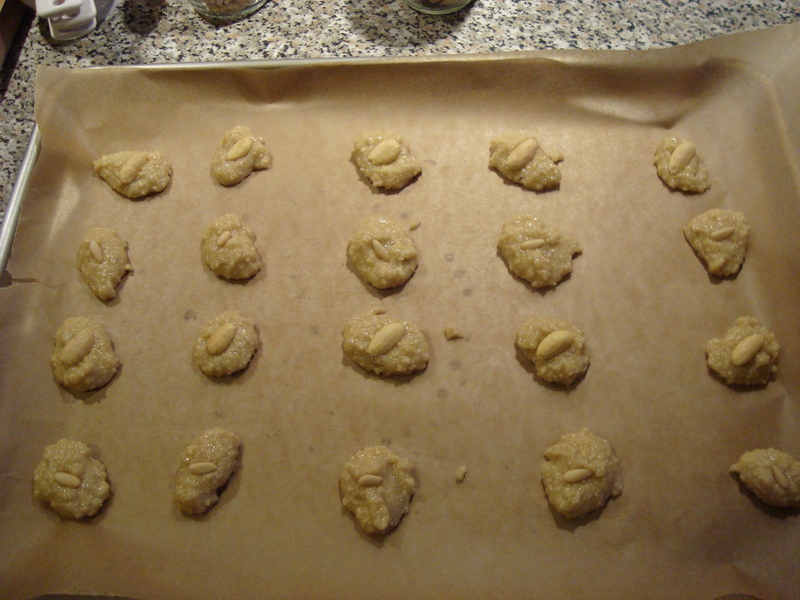 Bake the macaroons until a light golden brown on bottom and edges, around 15-17 minutes. Allow to cool slightly, then transfer to a wire cooling rack to cool completely. Store in an airtight container in the refrigerator for up to one week. These cookies can also be frozen. 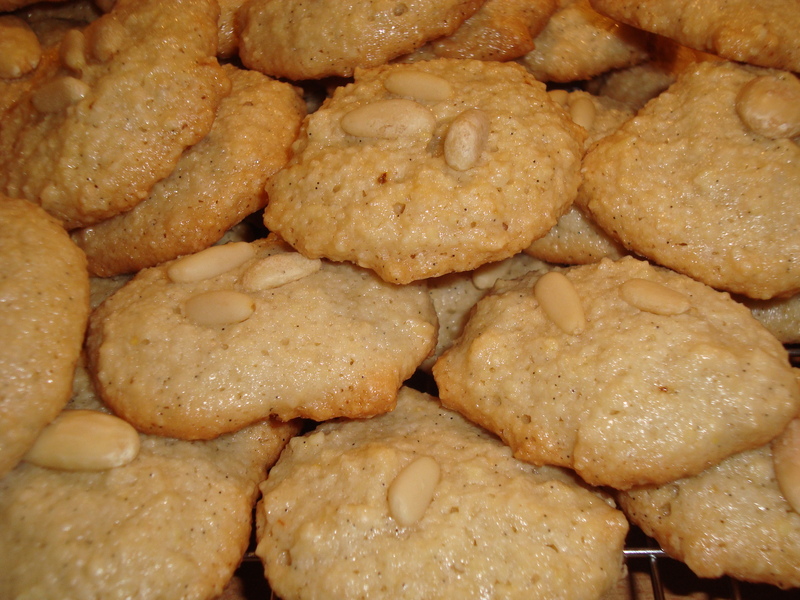 This entry was posted in Kosher, Recipes, Vegetarian and tagged almonds, cookies, eggs, gluten-free, Haggadah, Jennifer Abadi, Jewish, macaroons, Passover, pignoli, recipe, Seder, vanilla bean, vegetarian on April 17, 2011 by marinaberger.